In entering the new fiscal year, PT. 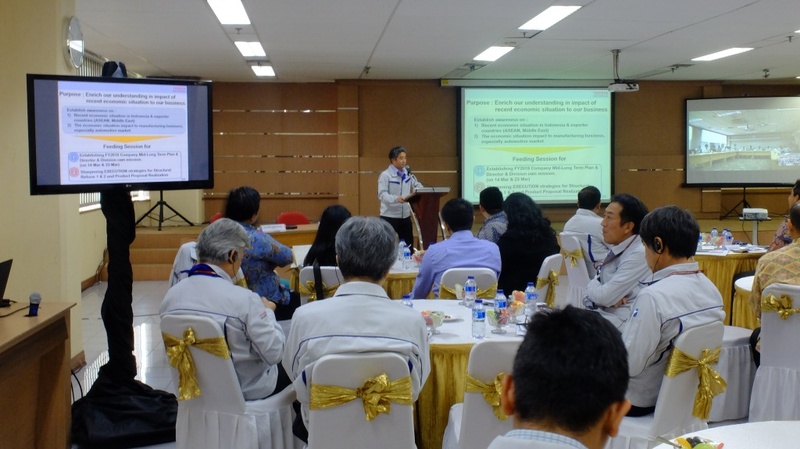 Toyota Motor Manufacturing Indonesia held a Macro Economic Seminar on Wednesday, February 7, 2018 as part of the Company Hoshin planning cycle activities. This annual agenda that held yearly was aim to employee leadership to be always up to date with the company's external conditions one of which is the current economic development. The theme of this year's seminar is "Indonesia Economic Outlook 2018 & Selected ASEAN and Middle East Countries Economic Highlights" which was directly delivered by practitioners from Bank of Tokyo-Mitsubishi UFJ. In his speech, Finance Director of PT. TMMIN, Mr. Keijiro Inada said that the importance of understanding from all team leaders on the latest economic trends that affect the automotive industry both in the domestic and global markets, especially in ASEAN countries and the Middle East as an export destination of Toyota Indonesia. Therefore, after attending this seminar, they are expected to sharpen the strategy and execution that will be created by considering the ongoing economic trends.